The Model #3, 1961; alkyd resin on canvas, 66 3/4 x 62 3/4 in. Flanked by Alexander #2, 1959 on the left; Alexander #3, 1960 on the right. They required layer after layer of paint. 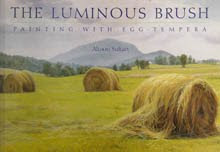 Otherwise you wouldn't get the simplicity and the lack of brushstrokes. It was like Chinese lacquer, you needed the layers to make it work. Alexander #2, 1959; alkyd resin on canvas, 66 3/4 x 60 3/4 in. Marriage #3, 1961; alkyd resin on canvas, 66 3/4 x 62 3/4 in. 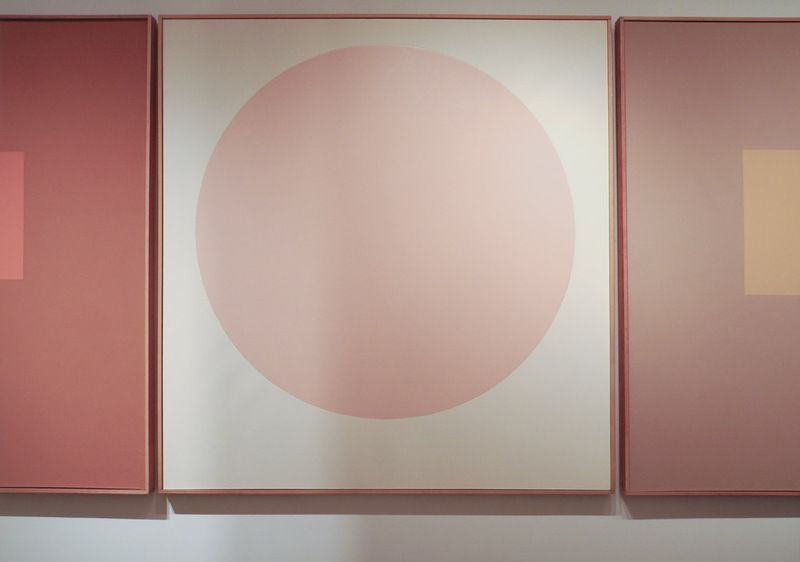 Another circle painting shows how color changes the presence of a simple shape. 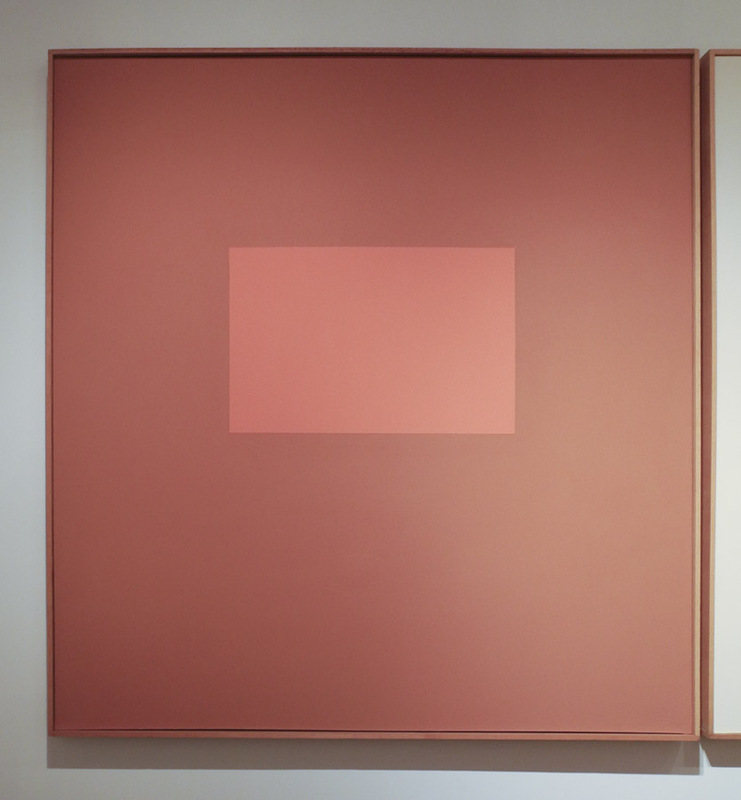 Even in its simplicity, the color turns the painting into something lyrical. 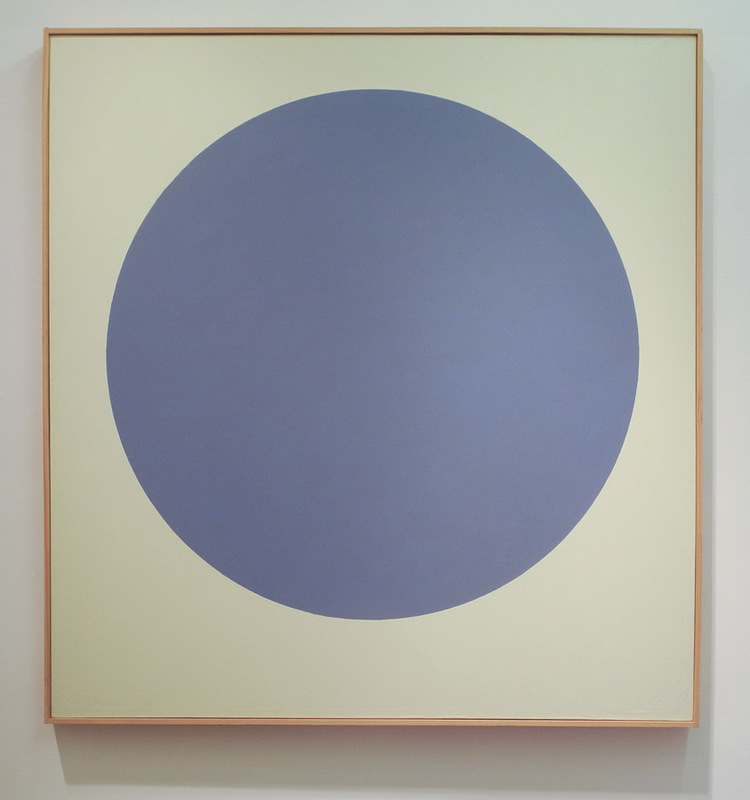 We can compare this to Malevich's Black Circle to see a very different expression with the same form. Cherokee Blanket #1, 1960; alkyd resin on canvas, 66 x 62 in. I love the nerviness of using a thin shocking pink border (or cherry red; I'm not sure how accurate my color is) for a large field of pink. 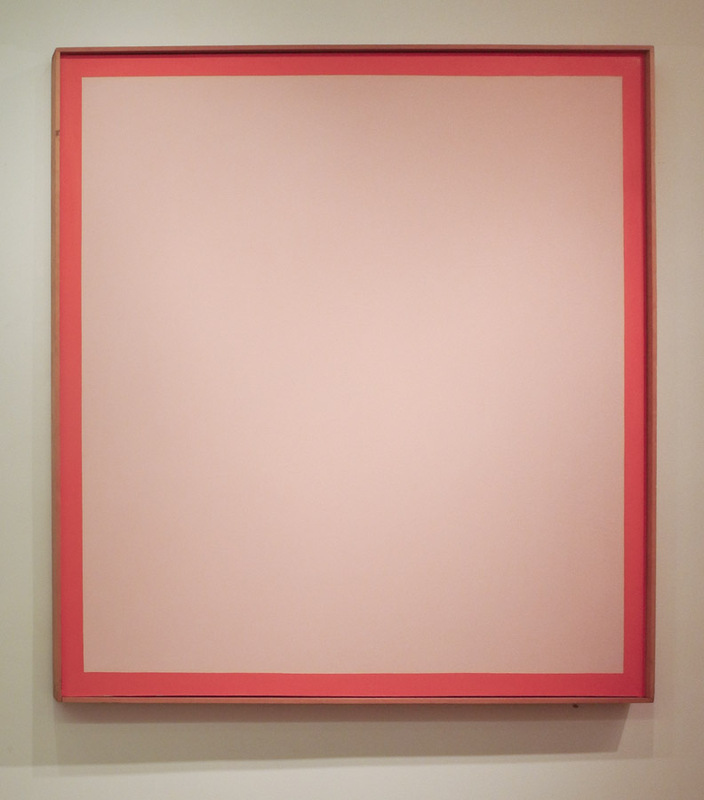 There is some subversiveness to this use of pink, different from that of Guston: a color usually decorative and frothy is here an atmospheric bounded field, tied to its geometry. 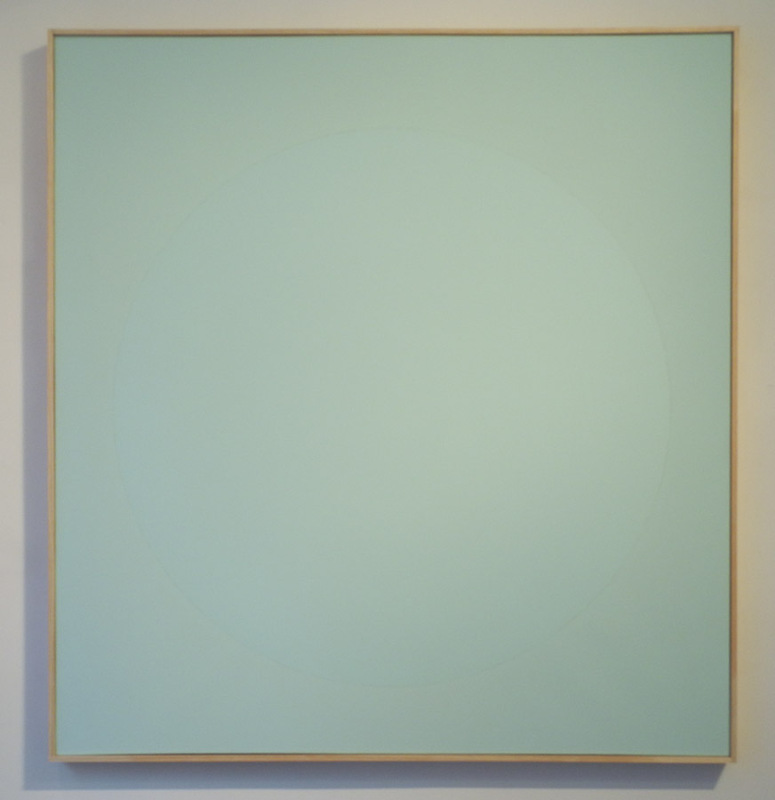 Pacific Glass, 1961; alkyd resin on canvas, 66 3/4 x 62 3/4 in. Pacific Glass has a similar structure to Alexander #2 above, but a very different sense of light and weight. Like its title it feels translucent. 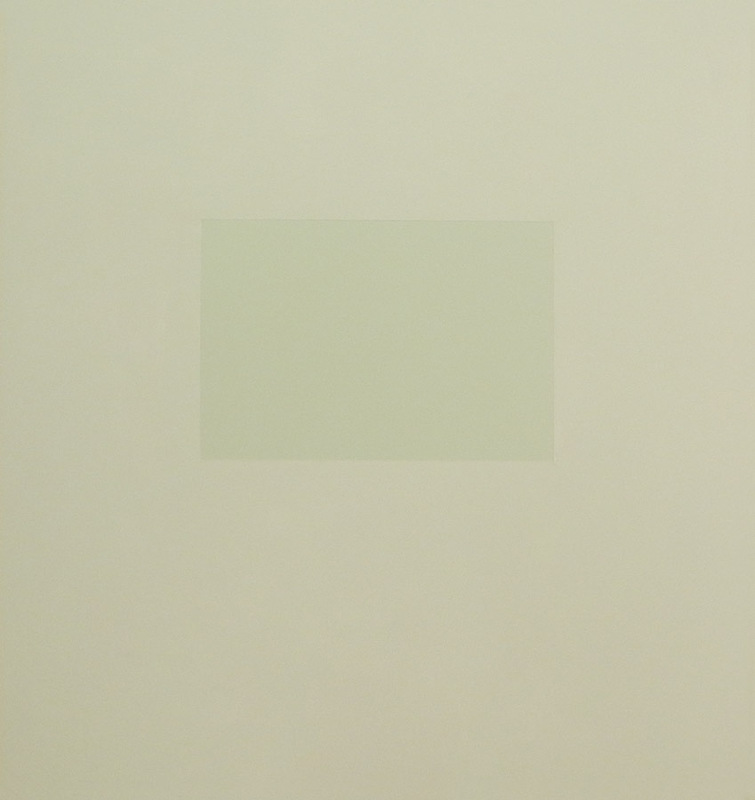 Aqua Same, 1962; alkyd resin on canvas, 66 3/4 x 62 3/4 in. Another circle, difficult to see in the sea-colored field. 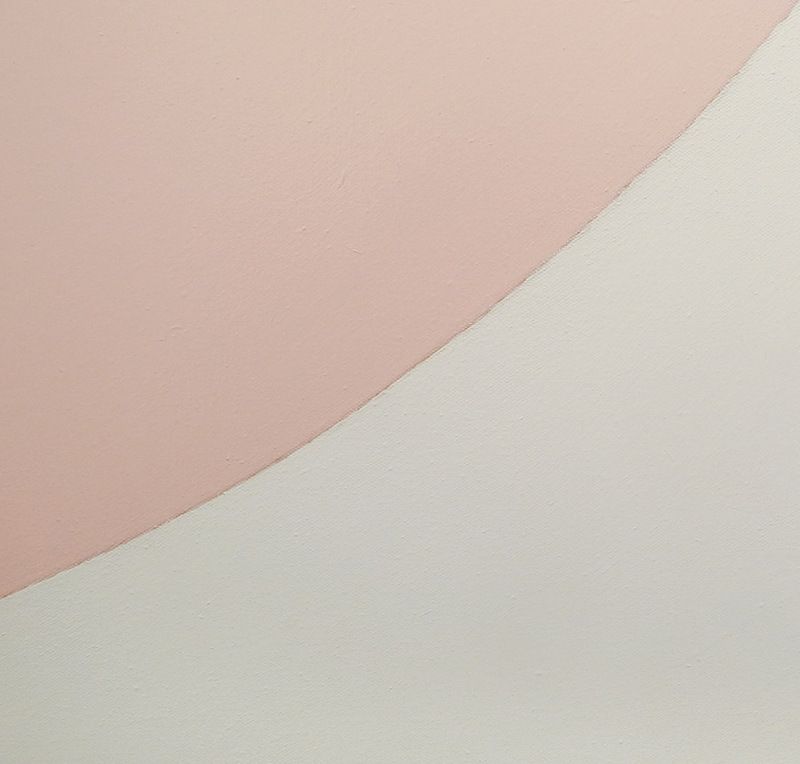 The surfaces, glossy and matte, are what differentiate figure and ground; they create a shifting visual experience, a poetry of color and light. Yellow Rose #1, 1963; alkyd resin on canvas, 66 3/4 x 62 3/4 in. A semicircle sits at the bottom of a canvas, yet because of its golden color, does not weigh the work down. It sits, it also rises; it animates the space above it. Seasons #1; 1965; oil on canvas, 66 3/4 x 62 3/4 in. 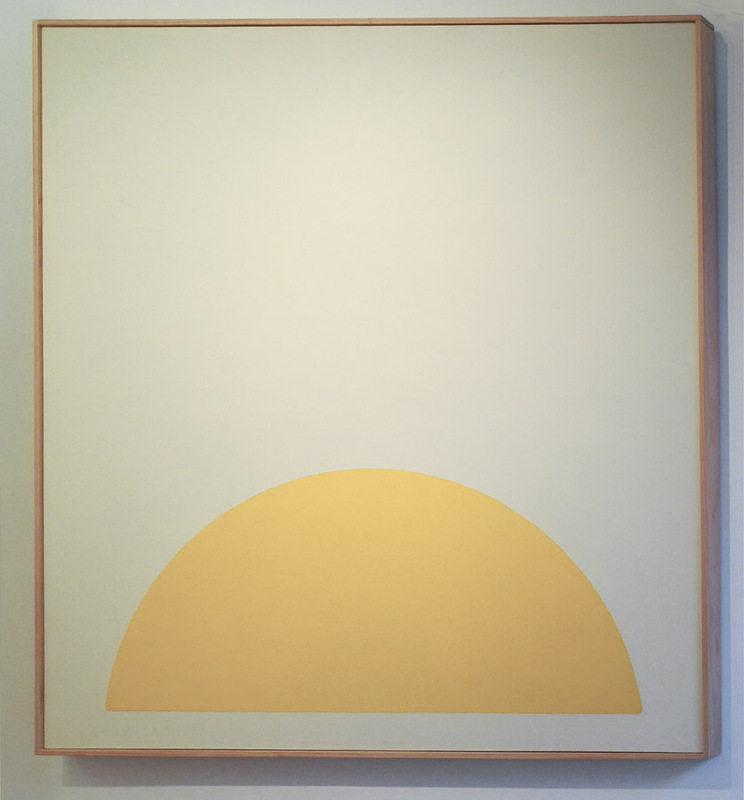 This painting indicates a different direction in the minimalist series. The forms bulge, swerve, float, bend. In the interview mentioned above, Bannard says that he became bored with doing the laborious work needed for these paintings. Seeing Jules Olitski's paintings showed him a different way forward. 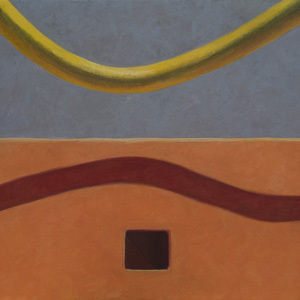 Bildad's Garden, 1980; acrylic on canvas, 11 1/4 x 34 3/4 in. Bildad's Garden, a later painting, has the same wonderful sense of color of the minimalist work, with more complexity in the relationship of hue and value. The poured surfaces are rich and varied. I saw this painting last year in a show at the same gallery, titled "Walter Darby Bannard: Dragon Water", which included works from the 70s. There were a lot of beautiful works in this show, which you can see at the link. 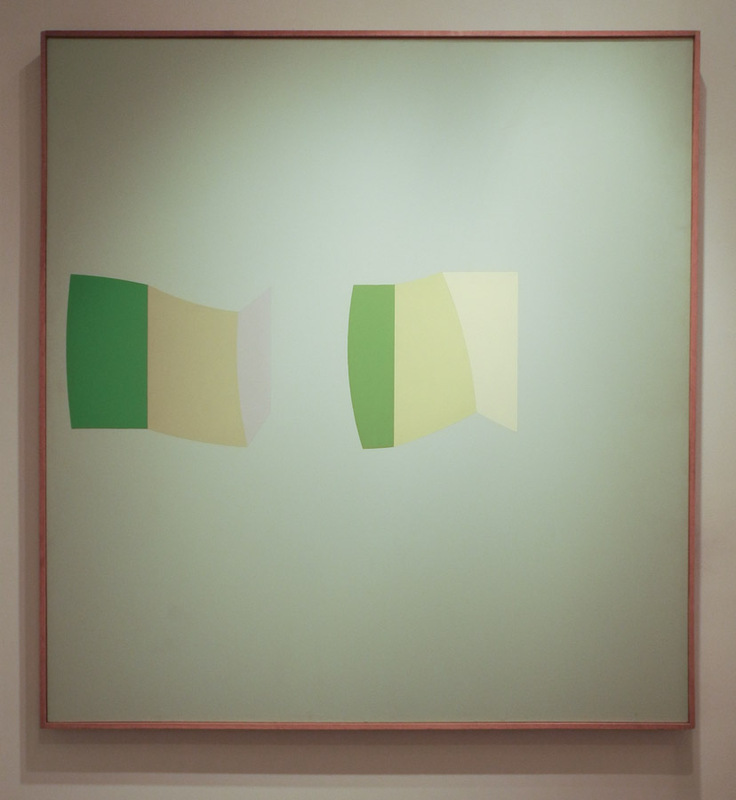 Both bodies of work show a keen sensitivity to surface and paint, and a vivid and personal use of color. Thanks, Altoon, for these beautiful images and good words. Viewing the paintings is like traveling to a relaxing place and seeing different things. The paintings bring home how important detail, even in a "minimal" image, works to engage us. I'm glad you enjoyed the post, James. I wish I could have had this kind of sensitive and perceptive reaction 50 years ago. The comparison to Malevich is particularly apt. I'm so very pleased that you like what I've written, Darby. I just go on my feelings, so if I've expressed something the artist approves of, it makes my posting especially worthwhile.